Human beings are often exposed to free radicals which are generated from normal metabolic processes in the body. Free radicals are not always harmful; however, high level of free radicals may disturb the normal cellular mechanism by inducing oxidative damage to DNA, protein and lipids which ultimately result in chromosomal instability and mutation , . Moreover, overproduction of free radicals may reduce the potency of the biological defence system to detoxify these radicals which result in oxidative stress. The oxidative stress might play a role in the risk of development of several metabolic diseases like cancer, cardiovascular diseases, diabetes, obesity, neurodegenerative and aging-related disorders , . Antioxidant mechanism delays or prevents free radicals formation and thereby suppresses the life-threatening diseases. Besides, it can prevent cancer progression by maintaining normal cell cycle regulation, inhibiting cell proliferation and inducing apoptosis , . Numerous plants and their active compounds are reported to possess the antioxidant activity which controls many disease conditions. Therefore, natural antioxidant compounds have been investigated for various types of treatment modalities including cancer , . In this context, we have selected the traditional Indian medicinal plant Tephrosia purpurea for our study. T. purpurea belongs to Fabaceae family, and it is distributed throughout India, popularly known as "Sharpunkha" in Sanskrit and "Wild Indigo" in English  . In Ayurvedic medication, different parts of this plant are used to treat various diseases like asthma, diarrhoea, jaundice, rheumatism and kidney disorders  . T. purpurea has also been reported to possess many pharmacological properties like anticancer, anti-inflammatory, anti-diabetic, wound healing, hepatoprotective, antiulcer, antimalarial, antimicrobial and antioxidant activities ,,,,,, . Despite the existence of few studies, there is no adequate knowledge about the antioxidant and cytotoxic properties of individual major parts of T. purpurea. Therefore, in the present study, we aimed to evaluate and compare the in vitro antioxidant and cytotoxic properties of methanolic extracts of T. purpurea leaves, root, stem and seed. We have also estimated the total phenolic and flavonoid content of these extracts by using standard methods. T. purpurea was collected at flowering stage from JIPMER Campus, Pondicherry, India. The plant was authenticated and deposited in Tamil Nadu Agricultural University, Coimbatore, Tamil Nadu, India with voucher No. BSI/SRC/5/23/2012-13/Tech. 368. Sequentially the collected plant was cleaned, washed and air-dried. Then, 100 g of different parts of T. purpurea such as leaves, root, stem and seed were extracted separately with methanol using soxhlet apparatus and the concentrated extracts were stored at 4 °C until further use. All the chemicals used were of molecular and analytical grades. where, control is absorbance of vehicle at 517 nm, test is absorbance of extract at 517 nm. The concentration of plant extract required to scavenge 50% of DPPH free radicals termed as IC 50 value. The ferric reducing antioxidant power (FRAP) assay was performed to measure the ferric tripyridyltriazine to ferrous tripyridyltriazine (Fe 2+ -TPTZ) iron reduction by extracts according to a method suggested by Benzie and Strain  . The FRAP was expressed as micromoles of ferrous equivalents, Fe(II) per mg of T. purpurea extracts (μmol Fe(II)/mg). Reducing power of an extract correlated with antioxidant activity, is determined by the ability to reduce Fe 3+ to the Fe 2+ and was described by Yen and Chen  . The reducing power of T. purpurea extracts was expressed as μg/mg of quercetin equivalent (QE/mg). where, control is the absorbance of control and test is absorbance of test (extracts or positive control). The cytotoxic property of T. purpurea extracts was assessed on SW620 colorectal cancer cells and these cells were obtained from National Center for Cell Science, Pune, India. Cancer cells were treated with 20-200 μg/mL of leaves extract and 100-1000 μg/mL of root, stem and seed extracts. 3-(4, 5-dimethylthiazolyl)-2,5 - diphenyl - tetrazolium bromide (MTT) colorimetric assay was used to study the cytotoxicity of the extracts (22). Total phenolic content (TPC) of extracts was determined by Folin Ciocalteu's method  . Gallic acid (20 - 100 μg/mL) was used as a standard to plot the curve and the T. purpurea extracts were expressed as μg/mg of gallic acid equivalent (GAE/mg). The presence of total flavonoid content (TFC) in T. purpurea extracts was measured using aluminium chloride method, as stated by Zou, et al.  . The total flavonoid content of each extract was expressed as μg/mg of quercetin equivalent (QE/mg), calculations were performed based on the calibration curve obtained from quercetin. Numerical data obtained from the three independent experiments were expressed as mean ± standard deviation (SD). Statistically significant differences among the four groups were analyzed using one-way analysis of variance (ANOVA) followed by Bonferroni multiple comparisons test using GraphPad (Version 3.06). A P-value < 0.05 was considered statistically significant. The DPPH free radical scavenging (IC 50 ) activity of T. purpurea extracts is shown in [Table 1]. The leaves extract significantly (P < 0.05) quenched the DPPH free radicals at a concentration of 186.3 ± 14.0 μg/mL as compared to other extracts which had antiradical activity at the concentrations of 276.7 ± 27.5 μg/mL (root), 269.6 ± 24.5 μg/mL (stem) and 341.6 ± 36.8 μg/mL (seed). Ascorbic acid as the positive control showed the IC 50 value at a concentration of 9.6 μg/mL. Table 1. Antioxidant activity of Tephrosia purpura extracts. The leaves extract showed significantly higher ferric reducing activity (754.2 ± 50.9 μmol Fe(II)/mg) followed by the stem (484.2 ± 32.3 μmol Fe(II)/mg ), seed (477.6 ± 21.4 μmol Fe(II)/mg) and root (239.5 ± 13.5 μmol Fe(II)/mg) ([Table 1]). The reducing power of T. purpurea extracts decreased as follows: Leaves (65.7 ± 4.2 μg QE/mg) > stem (48.1 ± 5.6 μg QE/mg) > seed (43.2 ± 3.3 μg QE/mg) > root (28.3 ± 3.0 μg QE/mg) ([Table 1]). All four extracts showed effective antihemolytic activity on human erythrocytes against AAPH ([Table 1]). Both extracts and positive control (gallic acid: 93 ± 2) showed more than 90% of antihemolytic activity. Statistically significant difference was not observed between the four groups. The leaves extract showed potent (p < 0.05) cytotoxic effect against SW620 colorectal cancer cells at a concentration (IC 50 ) of 95.73 ± 9.6 μg/mL. All other extracts showed the IC 50 values > 300 μg/mL for example, 382.33 ± 18.78 μg/mL (root), 324.80 ± 21.20 μg/mL (stem) and 303.97 ± 24.31 μg/mL (seed) ([Table 2]; [Figure 1]). Table 2. Cytotoxic activity, phenolic and flavonoid content of Tephrosia purpurea extracts. Figure 1. The cytotoxic effect of (A) leaves, (B) root, (C) stem and (D) seed extracts of Tephrosia purpurea on SW620 colorectal cancer cells after exposure for 24 h. Percentage of inhibition of cancer cell proliferation was determined by MTT assay. Values are expressed as mean ± SD of three independent experiments (n = 3). The concentration of T. purpurea extract required to inhibit 50% of the SW620 cancer cell growth was termed as IC 50 value. Total phenolic and flavonoid content in four methanolic extracts of T. purpurea are given in [Table 2]. The TPC varies from 46.8 ± 4.0 μg GAE/mg to 90.5 ± 6.7 μg GAE/mg of the different parts of the plant. Also it was higher in the leaves extract. The leaves and the seed extracts had the maximum amount of TFC (21.8 ± 5.4 μg QE/mg and 21.4 ± 4.2 μg QE/mg, respectively), followed by root (14.3 ± 2.9 μg QE/mg) and stem extracts (12.9 ± 3.2 μg QE/mg). However, the significant difference was not found between the studied groups ([Table 2]). The present study evaluated and compared the antioxidant and cytotoxic properties of methanolic extracts of four parts of T. purpurea such as leaves, root, stem and seed and also estimated their total phenolic and flavonoid content. The leaves extract showed more antioxidant and cytotoxic activities when compared to other parts. To determine the antioxidant potential of T. purpurea extracts, DPPH, FRAP, reducing power assay and anti-hemolytic assay were carried out. These assays, in general, were used as in vitro methods to evaluate the antioxidant activity of plant extracts and compounds. The antioxidant activity indicates the capacity to quench more reactive oxygen species (ROS) leading to decreased oxidative stress. It is a well-known fact that the medicinal plants are important sources of natural antioxidants. The leaves of T. purpurea are rich in phenolic and flavonoid content and this could be the reason for the higher antioxidant activity. DPPH assay evaluated the potential of test compounds to quench DPPH radicals via hydrogen donating ability. The antioxidant agents convert DPPH into a stable diamagnetic molecule, 1-1diphenyl-2-picryl hydrazine by transferring electron or hydrogen. The colour change from purple to yellow indicates the increasing radical scavenging activity of the test compound  . The DPPH free radical scavenging activity of four different parts was evaluated and compared. The leaves extract showed higher activity ([Table 1]). The DPPH radical scavenging activity of root extract is in agreement with similar results reported by a previous study by Nile, et al.  . Both FRAP and reducing power assay are based on the reduction of Fe 3+ complex to Fe 2+ form. The reducing power of extracts was directly correlated with the antioxidant activity. In both the assays, leaves extract exhibited the highest antioxidant activity by reducing ferric iron to ferrous form. Previous studies also observed the leaves and root extract of T. purpurea possessed potent antioxidant activity , . The oxidative stress is known to induce erythrocyte membrane lysis. The antioxidant compounds from plants are believed to inhibit RBC membrane lysis by decreasing lipid peroxidation , . In our study, all four extracts showed relatively similar antihemolytic activity against AAPH. This finding suggests the protective role of T. purpurea extracts towards RBCs by preventing the free radical-induced hemolysis. Also, it indicates nil or less toxicity to blood cells while it strongly protects the RBC cells from AAPH induced toxicity. Earlier this plant was used as a blood purifier and the reason for the same could be its protective role on RBC cells against hemolysis. A similar report where Thymus satureioides extract exhibited protective activity against AAPH induced hemolysis due to the presence of antioxidants , . The main obstacle to current anticancer therapy is chemotherapy-induced toxicity. Whereas herbal medicines are considered safe as they produce minimal or no adverse effects over modern synthetic drugs  . In the current study, the anticancer activity of extracts of T. purpurea on SW620 colorectal cancer cell lines was evaluated. 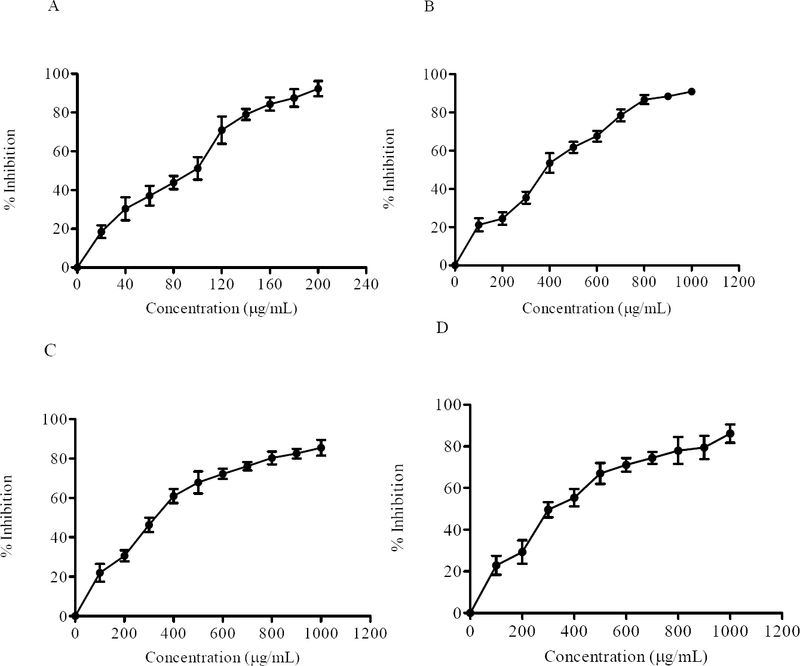 The leaves extract exhibited high growth inhibitory activity on colorectal cancer cells at < 100 μg/mL of IC 50 concentration. While the remaining three extracts showed more than 300 μg/mL of IC 50 values. Gulecha, et al. reported the cytotoxic activity of T. purpurea leaves fractions on MCF7 cell lines. Hussain, et al. reported the chemopreventive potential of T. purpurea on N-nitrosodiethylamine-induced hepatocarcino-genesis by virtue of its antioxidant property , . These findings are in concordance with the results of the present study where we observed that all the parts of T. purpurea extract (leaves, root, stem, and seed) exhibited cytotoxicity and this effect was more pronounced with leaves extract. The cytotoxic effect of the plant extracts could be attributed to the apoptotic activity. However, further molecular mechanistic studies are required to delineate the exact role of these extracts on the anticancer and apoptotic activity. Our study demonstrated that the amount of TPC was higher in the extracts of all the parts of T. purpurea; however, it is significantly more in leaves and seed extracts. On the other hand, statistically significant difference was not observed in the flavonoid content among the four groups. A previous study has reported the presence of total phenolic and flavonoid content in aqueous and ethanolic extracts of T. purpurea  . The study by Nile, et al. assayed the TPC and TFC of methanolic root extract of T. purpurea and the phenolic content reported in the study is in agreement with that reported in our study though the results of flavonoids in these studies did not agree  . Flavonoids are the important major group of polyphenols, over 4000 varieties of flavonoids have been identified. These flavonoids often accumulate in the leaves due to the biosynthesis and also in other aerial parts of plant. This could be the reason for the presence of higher phenolic and flavonoid content in the leaves extract of T. purpurea in comparison with the other parts  . Several previous studies have clearly proven that the polyphenolic compounds are excellent antioxidants and play a crucial role in the defence against free radicals due to hydrogen donating ability or potential to scavenge oxidizing species. Also, these phenols and flavonoids are reported to act as effective anticancer agents by inducing cell cycle arrest, apoptosis and anti-angiogenic activities ,, . As reported in previous studies, our study also showed the degree of antioxidant and cytotoxic effects vary with the extent of phenolic and flavonoid content in T. purpurea extracts. However, the root extract though rich in phenolic and flavonoid content showed the least antioxidant and cytotoxic activities and we could not explain this exception. Further studies are needed to identify the active compounds responsible for the above activities. The leaves extract of T. purpurea has higher antioxidant and cytotoxic activities when compared to the extracts of root, stem and seed. This could be attributed to the presence of rich phenolic and flavonoid content in the leaves. It may be prudent to further explore the leaves extract for its usefulness in the oxidative stress induced disorders and cancer. Currently, we are in the process of isolating from the leaves of T. purpurea the active compounds which are responsible for the antioxidant and anticancer activity. The authors thank JIPMER intramural fund for financial support. Jacob RA, Burri BJ. Oxidative damage and defense. Am J Clin Nutr 1996;63(6):985S-990S. Schumacker PT. Reactive oxygen species in cancer: A dance with the Devil. Cancer Cell. 2015;27(2):156-157. Ïuraèková Z. Some current insights into oxidative stress. Physiol Res. 2010;59:459-469. Bonomini F, Rodella LF, Rezzani R. metabolic syndrome, aging and involvement of oxidative stress. Aging Dis. 2015;6(2):109-120. Mates JM. Effects of antioxidant enzymes in the molecular control of reactive oxygen species toxicology. Toxicology. 2000;153:83-104. Valko M, Leibfritz D, Moncol J, Cronin MTD, Mazur M, Telser J. Free radicals and antioxidants in normal physiological functions and human disease. Int J Biochem Cell Biol. 2007;39(1):44-84. Pandey KB, Rizvi SI. Plant polyphenols as dietary antioxidants in human health and disease. Oxid Med Cell Longev. 2009;2(5):270-278. Firuzi O, Miri R, Tavakkoli M, Saso L. Antioxidant therapy: current status and future prospects. Curr Med Chem. 2011;18(25):3871-3888. Chopra RN, Nayar SL, Chopra IC. Glossary of Indian medicinal plants. New Delhi: Council of scientific and industrial research; 1956. pp. 234 . Kirtikar KR, Basu BD. Indian medicinal plants, 2nd ed. Allahabad: Lalit Mohan Basu; 1956. pp. 126. Gulecha V, Sivakuma T. Anticancer activity of Tephrosia purpurea and Ficus religiosa using MCF 7 cell lines. Asian Pac J Trop Med. 2011;4:526-529. Shenoy S, Shwetha K, Prabhu K, Maradi R, Bairy K, Shanbhag T. Evaluation of antiinflammatory activity of Tephrosia purpurea in rats. Asian Pac J Trop Med. 2010;3(3):193-195. Pavana P, Sethupathy S, Santha K, Manoharan S. Effects of Tephrosia purpurea aqueous seed extract on blood glucose and antioxidant enzyme activities in streptozotocin induced diabetic rats. Afr J Tradit CAM. 2009;6:78-86. Lodhi S, Pawar RS, Jain AP, Singhai AK. Wound healing potential of Tephrosia purpurea (Linn.) Pers. in rats. J Ethnopharmacol. 2006;108:204-210. Khatri A, Garg A, Agrawal SS. Evaluation of hepatoprotective activity of aerial parts of Tephrosia purpurea L. and stem bark of Tecomella undulata. J Ethnopharmacol. 2009;122:1-5. Chinniah A, Mohapatra S, Goswami S, Mahapatra A, Kar SK, Mallavadhani UV, et al. On the potential of Tephrosia purpurea as anti-Helicobacter pylori agent. J Ethnopharmacol. 2009;124:642-645. Patel A, Patel A, Patel A, Patel NM. Determination of polyphenols and free radical scavenging activity of Tephrosia purpurea linn leaves (Leguminosae). Pharmacogn Res. 2010;2(3):152-158. Rahman MAA, Moon S. Antioxidant polyphenol glycosides from the plant Draba nemorosa. Bull-Korean Chem Soc. 2007;28:827-831. Benzie IF, Strain JJ. Ferric reducing/antioxidant power assay: direct measure of total antioxidant activity of biological fluids and modified version for simultaneous measurement of total antioxidant power and ascorbic acid concentration. Methods Enzymol. 1999;299:15-27. Yen GC, Chen HY. Antioxidant activity of various tea extracts in relation to their antimutagenicity. J Agric Food Chem. 1995;43:27-32. He ZD, Lau KM, Xu HX, Li PC, But PH. Antioxidant activity of phenylethanoid glycosides from Brandisia hancei. J Ethnopharmacol. 2000;71(3):483-486. Singleton VL, Rossi JA. Colorimetry of total phenolics with phosphomolybdic-phosphotungstic acid reagents. Am J Enol Vitic. 1965;16:144-158. Zou Y, Lu Y, Wei D. Antioxidant activity of a flavonoid-rich extract of Hypericum perforatum L . in vitro. J Agric Food Chem 2004;52(16):5032-5039. Thambiraj J, Paulsamy S, Sevukaperumal R. Evaluation of in vitro antioxidant activity in the traditional medicinal shrub of western districts of Tamilnadu, India, Acalypha fruticosa Forssk. (Euphorbiaceae). Asian Pac J Trop Biomed. 2012;2(1, Supplement):S127-S130. Nile SH, Khobragade CN. Phytochemical analysis, antioxidant and xanthine oxidase inhibitory activity of Tephrosia purpurea Linn. root extract. IJNPR. 2011;2(1);52-58. Choudhary GP. In vitro antioxidant studies of the ethanolic extract of Tephrosia purpurea L. Anc Sci Life. 2007;27(1):26-30. Fibach E, Rachmilewitz E. The role of oxidative stress in hemolytic anemia. Curr Mol Med. 2008;8(7):609-619. Audomkasok S, Singpha W, Chachiyo S, Somsak V. Antihemolytic activities of green tea, safflower, and mulberry extracts during Plasmodium berghei infection in mice. J Pathog. 2014;2014:1-4. Khalafalah AK, Yousef AH, Esmail AM, Abdelrazik MH, Hegazy MEF, Mohamed AEH. Chemical constituents of Tephrosia purpurea. Pharmacogn Res. 2010;2(2):72-75. Ramchoun M, Sellam K, Harnafi H, Alem C, Benlyas M, Khallouki F, et al. Investigation of antioxidant and antihemolytic properties of Thymus satureioides collected from Tafilalet Region, south-east of Morocco. Asian Pac J Trop Biomed. 2015;5(2):93-100. Gokhale SB. Textbook of pharmacognosy, Nirali Prakashan, Pune. 1979:pp. 246-268. Hussain T, Siddiqui HH, Fareed S, Vijayakumar M, Rao CV. Chemopreventive evaluation of Tephrosia purpurea against N -nitrosodiethylamine-induced hepatocarcinogenesis in Wistar rats: Hepatocarcinogenesis suppressed by TPE. J Pharm Pharmacol. 2012;64(8):1195-1205. Vijayalakshmi A, Kumar PR, Sakthi Priyadarsini S, Meenaxshi C. In vitro antioxidant and anticancer activity of flavonoid fraction from the aerial parts of Cissus quadrangularis linn. against human breast carcinoma cell lines. J Chem 2013;2013:1-9. Ghasemzadeh A, Jaafar HZ. Profiling of phenolic compounds and their antioxidant and anticancer activities in pandan (Pandanus amaryllifolius Roxb.) extracts from different locations of Malaysia. BMC Complement Altern Med. 2013;13(1):341. Chahar MK, Sharma N, Dobhal MP, Joshi YC. Flavonoids: A versatile source of anticancer drugs. Pharmacogn Rev. 2011;5(9):1-12.